Bahulasva: They don't want the solution, Prabhupada. 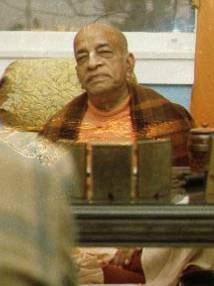 Prabhupada: That is another thing. They want to be cheated. That's all. Bahulasva: Just like now is the gasoline problem. Now the scientists want to use sun energy. They want to make a new energy, solar energy, from the sun. Prabhupada: That is another bluff. Bahulasva: We were preaching in Mexico that "You simply perform the sankirtana-yagna and Krishna will supply all energy." Prabhupada: Yes. He is the source of all energy. Karandhara: Most economists, they realize that the economy is very faulty and superficial, but they say, "Well, that's the way it is. So I'm going to take advantage of it while I can." Prabhupada: Why not take advantage of this Krishna consciousness movement and try it? As you are trying so many methods, why not try this?